Edited European Southern Observatory image of a nebula in the shape (roughly) of a bat in the constellation of Orion. Color/processing variant. Original caption: Hidden in one of the darkest corners of the Orion constellation, this Cosmic Bat is spreading its hazy wings through interstellar space two thousand light-years away. It is illuminated by the young stars nestled in its core — despite being shrouded by opaque clouds of dust, their bright rays still illuminate the nebula. 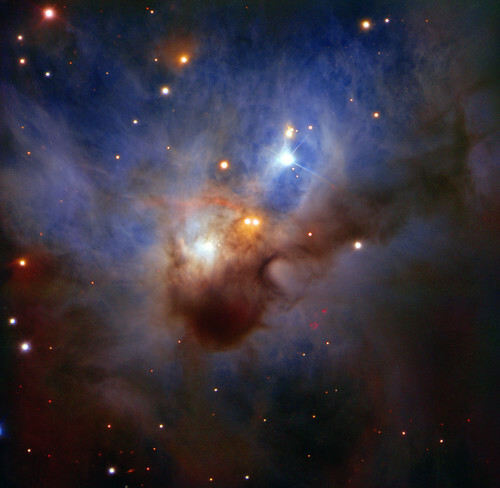 Too dim to be discerned by the naked eye, NGC 1788 reveals its soft colours to ESO's Very Large Telescope in this image — the most detailed to date.